Everyone wants a place in one's home or work place to set his computer and its entire range of peripherals so that everything comes handy when working. I for myself call my small computer room my cockpit from where my thoughts originate and fly out through my internet connection to the world. But all such work stations are just the ordinary - a table with a side table housing all gadgets connected to the desktop with lot of witting hanging around. This is the work place of the ordinary. Not of the men with a futuristic approach and something crazy instilled in their genetic motherboards. Such crazy futuristic inventors always come out with something unique, futurist, yet the crazy. 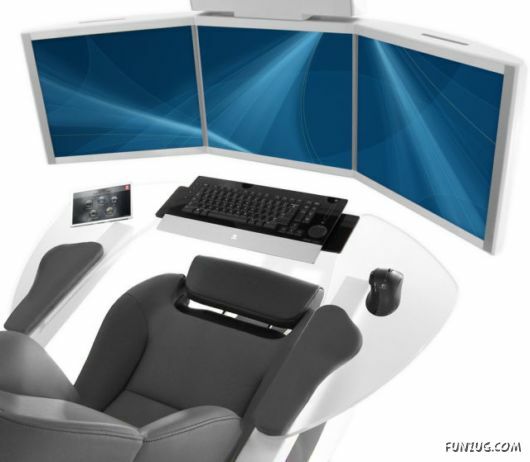 And I think the craziest workstation of of the future that was invented in 2012 is the one that makes its users to sit as if one is sitting in a spaceship with a wide array of screens, ready to allow ones ideas to take off into the world of the www. 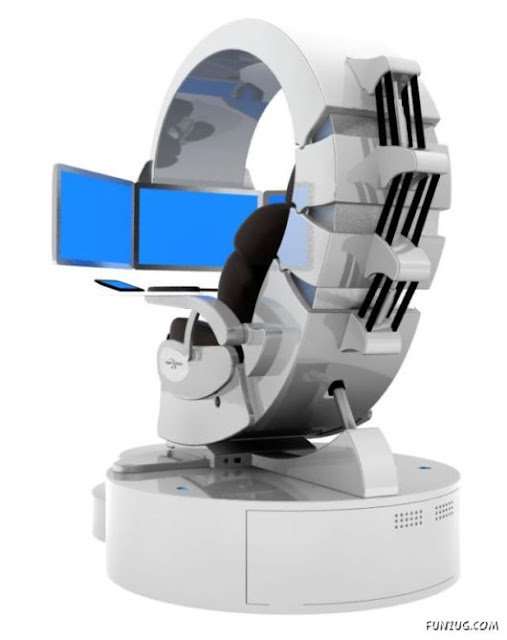 The Emperor 200 is the workstation I am talking about, invented earlier this year and made headlines. 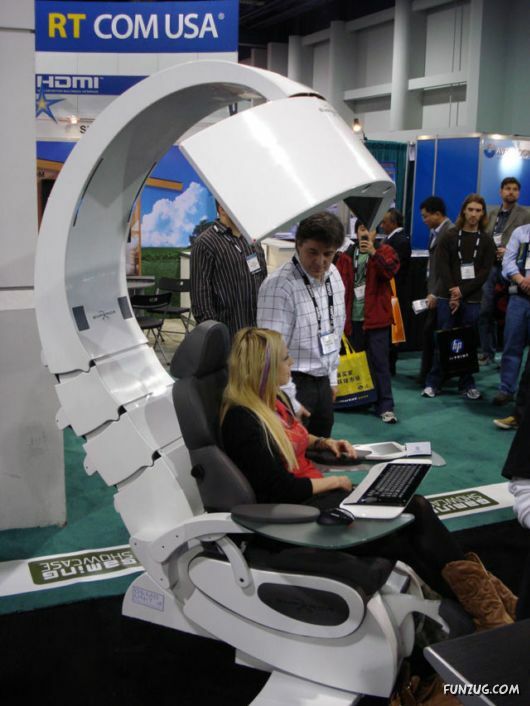 Now that 2012 is about to be wrapped u, I thought of sharing this innovative, futurist and craziest invention of 2012 with my readers. 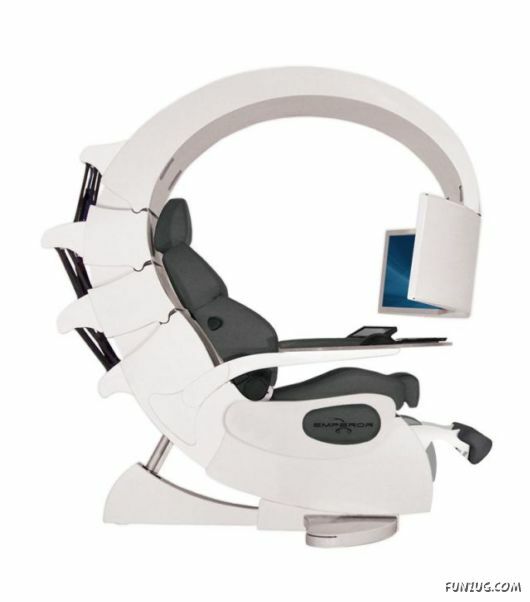 This over-the-top looking workstation features "touch screen control center, air filtering system, light therapy, electric powered leather seat, up to 3 x 27" LED screens and breathtaking sound." Each LED-backlit LCD screen with HD resolution is connected to the computer via a set of three HDMI cables. It’s also got built-in LED lighting both above and below the seating area, and a THX surround sound system.